Safely and comfortably fade the appearance of skin imperfections and uneven skin tones caused by the sun, as well as uneven skin tones caused by brown and red spots (such as rosacea, spider veins and age spots). 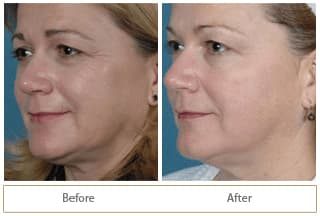 FotoFacial RF Pro® is a unique photofacial treatment that addresses a number of cosmetic skin concerns for the face and body (also known as FotoBody™ RF treatments). With elos™ technology, RadioFrequency and Intense Pulsed Light, one FotoFacial RF Pro® treatment will achieve the optimal degree of enhancement to all components of your skin, unlike other photofacial treatments that use only one type of technology. There is no downtime. What is the technology behind FotoFacial RF Pro®? FotoFacial RF Pro® uses elos™ technology, a combination of Intense Pulsed Light (IPL), Diode Laser, and RadioFrequency (RF) energy to achieve the optimal degree of improvement to all components of targeted skin. This treatment has no downtime when improving redness, rosacea, pinkness, spider veins, pores and texture. The results are amazing! Rosacea, flushing, redness, ruddy complexion, broken capillaries and spider veins of the face. All these “pink” vascular based conditions of the skin improve by up to 80%. Sun spots, age spots, hyperpigmentation and multiple freckles. All these “brown”, melanin based conditions of the skin improve, on average, by up to 80%. Chronic sun damage and photoaging improves up to 80%. Sun damage and the signs of aging that develop on the hands, neck and chest can be improved by up to 80%. Please Note: All patients must undergo our medical consultation with one of our licensed physicians prior to receiving prescription medication. 1. Why is elos™ different? 2. Is FotoFacial RF Pro® painful? Patient with visible capillaries treated with photofacial rejuvenation, also known as fotofacial. Shows before and after. 3. What areas can be targeted? The full face, neck, hands and body may be targeted. Although it’s called a photo facial, that doesn’t mean it’s only for your face! You can use it on other parts of your body with results that are just as safe and effective. 4. I have tanned skin. Can I still get treated? If you just recently sunbathed and are tanned, then you’ll probably need to reschedule your session. Tanned skin is an indication that it’s been damaged, which means a photofacial treatment will be riskier for you. 5. Can I get a fotofacial if I have dark skin? Yes, the complexion beautifying system is safe for patients with darker skin shades. Whatever your skin tone or type, our medial aestheticians will make sure that your treatment will be performed safely. However, you should know that the risk of changes in skin pigmentation may be higher. 6. Is it okay to get this done if I'm on Accutane? Accutane® is a medication for acne. If you are currently taking Accutane®, photofacial rejuvenation is not suitable for you. You should wait at least six months after you’ve stopped taking the drug before you start your photofacial rejuvenation treatments. We’ve had some patients who were able to clear up their acne with photofacial rejuvenation without taking Accutane®, and didn’t have to experience the side effects related to the drug! 7. I'm pregnant. Can I still get treated? It’s safer if you delay your treatments until after you’ve given birth. 8. How does this technology work for wrinkles? Photo rejuvenation treatment involves directing high energy light waves at your problem areas to reduce or eliminate facial wrinkles. IPL energy boosts the production of collagen, the building block of healthy skin. With higher levels of collagen, your skin becomes remodelled to make it healthier and stronger. That’s how wrinkles disappear for smoother more supple skin. The results of each session get better and better. 9. What is the recovery like? Right after your treatment session, you’ll be able to get back to work. However, your skin will be red and maybe a bit puffy. The more sensitive your skin, the redder and puffier you’ll probably be. Make sure to protect your skin from sun exposure during your recovery because it will be hypersensitive to UV. Your skin will be delicate for a couple of weeks. During that time, make sure to follow the instructions you’ll get from us to properly care for your complexion. 10. How long will the results last? The best results are achieved in a series of 4-6 sessions spaced a couple of weeks apart. Maintenance sessions may be booked every six months or so, depending on the individual patient. Protecting the skin from the sun and following a healthy lifestyle will prolong results. The treatment resolves issues caused by genetic and environmental aging factors.